Stop motion animation is a very unique way of making a film and nobody does it better than Henry Selick. The Nightmare Before Christmas is a masterpiece but saddly Henry Selick rarely gets credit for it. Thanks to the marketing big wigs at Disney, most people think that Tim Burton directed the film when in fact he was a producer/writer with Henry Selick behind the camera. Of course Burton made his mark on the film (and I bet he had last word on many creative decisions) but ultimately the director of a film is the most importan person and Henry Selick is a magnificent one and deserves credit for his work. Naturally when I learned that a new stop motion film by Henry Selick, based on a book by brilliant writer Neil Gaiman was being developed I was really excited. 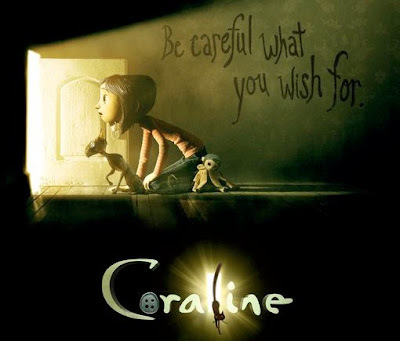 Coraline tells the story of a little girl who moves to a new house with her workaholic parents that pay little attention to her and her games. One day she discovers a small door that leads to a kind of alternate reality where her "other" parents always have time for her, singing songs, playing games and cooking her favourite meals. There's just one small catch. If she wants to stay there she must give her eyes and saw buttons on their place! The world that Gaimans' imagination has created and Selicks' craftmanship has built is beautiful and scary at the same time. The puppets and the sets built for the film are amazing and full of details and textures that are a pleasure to look at. I can't wait to own it on Blu-ray so I can marvel at all the work the people behind the film have done. Unfortunately I can't comment on the 3D aspect of the film because here in Greece it was only shown as a 2D film. But from what I read the 3D is used very well; not as a gimmick but as a way to immerse the viewer deeper into the wonderful world of Coraline. The voice work by the cast (Dakota Fanning as Coraline, Teri Hatcher as her mother/other mother, Keith David as the cat) is very good, as is the incredible music by Bruno Coulais that manages to create a perfect atmosphere for the film. I highly recommend Coraline. It is a magical film for people of all ages.